L-Isoleucine，encoded by the codons ATT, ATC, ATA, is an α-amino acid that is used in the biosynthesis of proteins. It contains an α-amino group (which is in the protonated −NH3+ form under biological conditions), an α-carboxylic acid group (which is in the deprotonated −COO− form under biological conditions), and a hydrocarbon side chain, classifying it as a non-polar, uncharged (at physiological pH), aliphatic amino acid. It is essential in humans, meaning the body cannot synthesize it, and must be ingested in our diet. 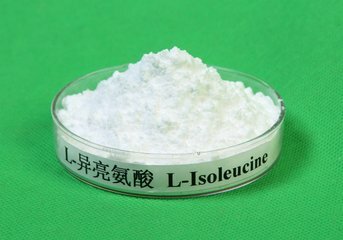 Isoleucine is synthesized from pyruvate employing leucine biosynthesis enzymes in other organisms such as bacteria.